This year I would like to get my weight, my blood pressure, and my cholesterol into the range (for each) that my doctor says they should be. I have 20 pounds to go, but 30 would be nicer. By the way, my jeans are not dirty, the mirror is! So achieving my goal will be accomplished through intentional care in what I am eating, and intentional increasing of my physical activity. I am currently still recovering from shoulder surgery mid-November, but I can start doing some walking in addition to the physical therapy activities I am working on each week. An adult child married and moved out, and I thought that would relieve some of the house's clutter. But it didn't. They moved into a very small apartment, and I was hit with, "I don't have room for it right now, but I want it. Please can we still keep it in your house for awhile until we can get a bigger place?" We're still working our way through the issue, but not quickly enough to make me happy. So, in the meantime I am trying to focus on my own clutter and declutter for 15 minutes a day most days. Intentionally. This year I need to finish homeschooling 8th grade, and start homeschooling... HIGH SCHOOL! Since I changed the basic History/Literature core I am using this year, a group of other regulars dropped out of our regular practices that I want to get back to. For awhile my son was reading on his own fairly well, and I stopped doing reading and hymns together. I think we would both benefit from getting this back into our "together" time. Nature Study has slid off my radar these past five months. Even when I try, and take photographs, I haven't blogged about it. So this year I hope to come up with some achievable goals in Nature Study and follow through with them. Below, rabbit tracks in our first snow. Same as the others. Dropped out of our practices. I'd like to get back to it, even if only once a week. Same. Plan it, do it. Intentional. This is really lacking, and my son and I both need it, so I'm going to try to integrate it into our plans. I need to get my ducks in a row and implement high school well, keep good records, and prepare my son for what he wants to do as an adult. Right now his aspirations lean towards computers and engineering. We'll see. But I need to plot out his courses, settle on direction in certain areas, and keep good records. I've done this twice before. At least I have an idea of what I need to do. I don't want my record-keeping to be a game of "catch up" this time. I plan to continue my geneology studies and posts of family history and stories, to benefit my own kids, my nieces and nephews, and other distant relatives who are interested. I am, once again, on The Old Schoolhouse Homeschool Review Crew. Our review year runs January to November, and I intend to be intentional and careful about what products I ask for, what I volunteer to review. I still owe some other vendors reviews, and I need to be intentional about getting them done and out of the way. I am working this year to be intentional in my close relationships. Sometimes, when we get busy, we meet all our outside commitments but let down those closest to us. I want to be intentional to make sure this doesn't happen. I am already intentional in certain areas, and in these areas I intend to maintain -- menu planning, shopping, meal preparation, blogging, etc. My housekeeping has slipped, but I plan to bring it back in line. So, how about you? 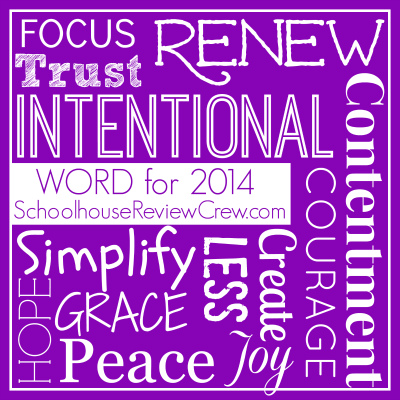 Do you have a word that would sum up your plans for 2013? Let me know. Well, I didn't post menu plans for the past two Mondays. I promise you, we really did eat dinner every night. But at this point I'm not going to post what we had. I'll just move on. So here are my plans for the coming week. The meals will be decidedly omnivorous, with the vegetarian taking meals out of the freezer stash as needed. Sorry for posting this one late. I'm not sure why I started thinking about this, but since I did I thought I'd write a post about it. It contains enough of my childhood that it counts as a "family story" that I think my kids and niece and nephew will like. In the 1960s, my family was poor. I didn't know we were at the time, but I know it now. What was my life like? Child care: if my mom needed to go some where and needed child care we went to Gram's, Aunt Carole's or the neighbor's. There was no "Day Care" in my world. It may have existed somewhere, but I was not aware of it. It may not have even existed yet. To save money, Dad kept the hot water heater turned off except when we needed baths or showers. There was no such thing as a disposable diaper. Mom bought cloth, and one size fits all -- you just pin differently for boys vs. girls and the pins also adjust the size. There were no plastic pants. In the summer kids in diapers were just kids in diapers. When the diaper was wet (or other), Mom knew it quickly and it got changed. If something else got wet... Oh well. She cleaned it up. Laundry was washed, and then hung out to dry. We owned a dryer part of the time, but we didn't use it if we could use the "great outdoors". One car. Mom didn't drive anyway. She didn't have a license. If she wanted to go somewhere, she rode her bike. If one of us was going with her, we rode behind her on the rack. Restaurants ...I didn't know about them. We ate at home. Dinners - Mom's budget for groceries was $15, and she had to find a way to feed us on that. Chuck was sometimes $0.15/pound, so that's when she would buy it. A cheap night was sausage and eggs on toast. It might be a British dish. One slice toast, one patty, canned tomato, juice.. We would also eat fish n' chips n' vinegar, and fried beef liver. Lunch, I remember canned soup. I remember water cress sandwiches at Grama's. Clothes. We were thankful when we had them. Gram sewed. I had no coat until she made one for me. She sewed a furry hat and a matching muff for me as well. Our dresses looked like upholstery fabric because they were made from leftover upholstery fabric. Hand-me-downs were a way of life -- I had an older sister. School milk and lunches - Milk was two cents a carton back then, so it was pretty inexpensive, but we still took our own. I had a nice little lunch box with a Thermos bottle, and we took our lunch to school every day. Once, though, I bought my milk and didn't drink it, so I saved it. That was when I learned that milk went sour if you didn't refrigerate it. Yuck! Working moms -- moms that got jobs drove school buses, worked in the school cafeteria, or worked during the day in a local sandwich shop. These jobs did not require that they arrange child care. Heating and air conditioning - Dad turned the heat wayyy down at night. We heated with oil, and the truck came once a winter. We supplemented with our fireplace, burning wood that came from our property. Air conditioning? Never heard of it. We had a fan. Even the grocery store didn't have it. Sometimes we'd stand by the store's freezer section a short while to cool off. Mostly we went to swim in Aunt Carole's pond. Telephone - there was one telephone in the house, and it was a party line. If you picked it up to make a telephone call, someone else might already be using the line and you would have to wait. Television - there was one set, it was black and white, and using it did not cost any more than the cost of electricity. There were from four to seven channels, and the channels signed off at a decent hour with the Star Spangled Banner playing while the screen showed an American Flag blowing in the background. Christmas - in 1965, my Christmas gifts were: a Raggedy Ann doll and a Bazooka gun. (I was a tomboy.) My dad wanted Mom to just give me one gift, but she put her foot down. Toys: My brother had a set of wooden building blocks and a set of Lincoln logs. If I asked permission, I could sometimes play with them with him. Most of the time we played in the dirt under the back overhang, or swung on the swing set. We also rode our bikes, which I had one because my grandmother (the "rich" one - the one that worked outside the home) bought for me for my 5th birthday. Lois and I also had Barbi and Skipper dolls. Mom made clothes for them. I still have them, and my Skipper, but I cut her hair. And I remember we had Colorforms. I don't remember what they were of, but I still have a set of Colorform letters. One of my favorite toys was a conveyer belt I'd been given for playing in the dirt. We'd send dirt up to the top to dump into my brother's dump truck. We spent hours making dirt roads to go over with our toy cars. We didn't have the money, so we didn't go to the doctor until we were sick. Then he gave us medicine (or stitched us up), and we went home. We only went back if we didn't get better. We paid the bill over time. Life in my childhood was, "Use it up, wear it out, make it do, or do without." Lois's clothes were made to fit me. I wore what I had for my feet. I had no hat, nor coat, nor gloves til Gram made one. I wore what I had, cause it was what I had. I never went to a clothing store til I was 12 years old, and then my year's clothing budget was $20 for everything. As soon as we could earn money, we did. It meant we could occasionally buy lunch at school, or a new dress, a Charms pop from the school store, or an other piece of candy. Before that, we didn't have the money so we went without. Everyone seems to have a cell phone. Why is this something the "poor" have? Everyone seems to pay for cable or satellite, and most have TEVO, as well as a DVD players, and probably a subscription to Netflix. I don't even have Netflix. Everyone seems to pay for trash pick-up. My hubby drives to the dump each week. People on public assistance have Coach bags and iPhones. We never went on public assistance. We went without. The "poor" seem to eat out constantly. What's up with that? I can't afford to eat out, and I'm NOT poor now! When I was in school I was mocked for having holes in my tennis shoes and in the knees of my slacks (high school). Other poor people lived in (literally) clapboard shacks, but they drove Cadilacs and wore stylish clothes. It was all about how you were seen by others. What things were like at home didn't matter. "Poor" kids buy their lunches, snacks, junk food and such at school. How can they afford that? I was borrowing money to buy a 20 cent bowl of chicken soup when I forgot to bring my lunch, and I was hard pressed to pay my friend back, ever. Now, thanks to the "unaffordable" health care act, poor people have to pay money and still not go to the doctor. Some of the money I used to pay to go to the doctor now goes to our increased cost for our plan, and my deductible is now so high that I will be paying 100% for everything unless something catastrophic happens, because I pay 100% until I reach my deductible, and I'm not likely to ever reach it. The typical "poor" family seems to have at least two cars. Why? We lived in the middle of no where when I was a kid. If we needed/wanted to get somewhere and the car wasn't available, we didn't go. If someone else has something that the poor person doesn't have, I hear, "That's not fair!" and someone in government is trying to make sure the poor person gets it. For free. Without working for it. If the poor person has something that the working person doesn't have because they can't afford it, I hear, "Oh well. Life's not fair." Someone in government is trying to make us all financially equal so that the hard-working person does not ever have more than the person who will not work. The "unemployed" can't afford to get a job, because unemployment pays so much that to take a full-time job would be a cut in pay. It's just wrong. Well, I guess that's about it for now. Let me know if you have any thoughts or anything to add. For a change of pace, I thought I'd post this non-holiday music video I found that is really amazing! I hope you enjoy. Amazed was I to find the SS liberals had done this! Had to post it. Very funny. Enjoy! I've always liked handbell pieces, and this video's music was very well done. Enjoy! Today I am sharing a link to Beethovin's Ode to Joy, done on the piano. Hope you enjoy this one. Ever hear of a "Glass Armonica"? This video is an amazing delight! It is a repeat of the Sugar Plum Fairy Dance music, but I think you will understand why I decided to do the repeat. Enjoy! I have new updated information on this family tree, and it is the information here at the top above the designation "Efraimson 1"
Matthias Palvalehto (1806 in Finland). Johan, firstborn above, is the same as the Johan in Efraimson 1 below. My family history that I have tracked down on the Efraimson family tree begins in 1788, with the birth of Johan Michaelis Palvalehto (my 5x-great-grandfather) in Finland. I love this one. Love Bing Crosby. Very nice. Enjoy. Thanks, Kim Komando! This is just amazing! Thank you, Kim Komando, for sharing. Enjoy! Credit due: Thank you, Kim Komando. Sunday: Two meals got bumped last week: one by pizza and one by excessive leftovers, so Sunday we had Broccoli Cheddar soup and vegan Broccoli Soup, from previous week's plans, served with salad and rolls. Monday: Monday was the second meal from previous week's plans. We ate red beans and rice, with salad on the side. Tuesday: Hubby decided tonight would be Steak-um Sandwiches and fries. I had vegan choices that I picked from. Friday: Driving a car-load of Boy Scouts to a cabin camping trip, so dinner on the road--have no idea if there will be vegan options. Saturday: No son in the house -- maybe hubs and I will go out on a date! What do you know about this "Common Core" movement that is coming to the public school system in our nation? Chances are there are things you don't know that you should, because the proponents of Common Core are trying to push this thing through and keep parents "out of the loop", and this is going to affect all of us. Don't stick your head in the sand because you home school. Will your future son or daughter-in-law have been home schooled? You just don't know. Watch this trailer of an upcoming movie I heard about from HSLDA, and watch for the full-length movie in February. I love NotebookingPages. Because of that, I have also chosen to be an affiliate. I've never yet earned anything from that affiliation, but the FTC requires that I tell you that this post contains affiliate links. There are even more things I could use it for that I haven't even scratched the surface of. State studies come to mind, and country studies. These can have a different direction that what I did in Geography studies. I was more using the pages to help my son understand locations where cities, states, rivers, mountains, colonies, etc. were located. Use your imagination and the sky's the limit on how you can use these pages! Capt. Piccard: "Let It Snow!" I don't know if I can post a funny one every day until Christmas, but I also found this one, so enjoy! This was just so fun I had to share! 23rd When you see a Crime punished, you may be inwardly Pleased; but always show Pity to the Suffering Offender. Which to me means we need to learn (and teach our children) to have self control and to display appropriate empathy for a situation, regardless of what our initial internal reaction may be. Ambleside Online does not list a folk song for December, 2013, but since I did not do the September song from their Folk Song Rotation I will be doing September's song for December - The Three Ravens. I selected a Peter, Paul and Mary video because it is good, and because I like Peter, Paul and Mary! But it is black and white, and my son does not like that, so at the very bottom there is another choice of video for you. The one of them said to his mate. "Where shall we now our breakfast take?" With a down, derry, derry, derry down, down. So well they do their master keep. As heavy with young as she might go. I'll be adapting winter squash stew, with turnip, parsnips, and other veggies I picked up, and probably some beans for protein. I also copied a recipe for vegan potato leek soup, but not only did I fail to get the web link so I can give credit, I also failed to find leek at the grocery store this week, so I probably won't make that. I was also going to make black beans and rice, but I found an interesting red beans and rice recipe which I'll be making instead. Again, though, I got the recipe but forgot to get the web address, so try searching for it if you want it. The Ambleside Online Hymn rotation for December 2013 is "How Great Thou Art". Now, I don't mean to be picky... I absolutely LOVE this song! But December is Christmas! They couldn't have picked a Christmas song? Really?